While I was looking at comments like Symbian is dead etc and was getting bored that there is nothing to talk about Symbian as of now, then a very prompt buddy of mine @Hardiklive tipped me that there is something new inside SW update of N8. 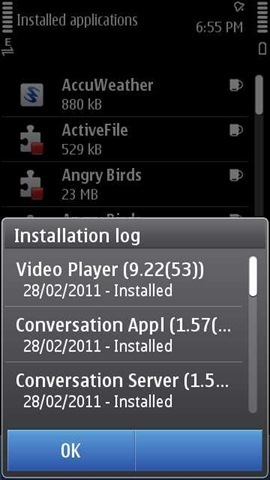 Trust me, whatever the update might be, we always feel excited if something new arrives for our Nokia N8. As of now, I am not only able to find the details as shown in screenshot and something more …. Notice that Video player has also got a minor update and from old version 9.22(52), the latest one is 9.22(53). While I know that numbers doesn’t matter for us much than the features itself, but somewhere this all seems to be related to internal indexing and search part. As per my experience, browsing through file manager got faster, same about messages. Yet to receive more details on it, though one thing is surprising here that is difference in size of updates received by different people. Please write to me if you found anything else about this update, till then I am trying my best to find out what’s changed for me here. Note: For the people, who are not able to see any software update for their N8, try by progressing the date to few days later like 28 Feb, it must appear in your N8 SW update app for sure. my update was 1267 kb. But what feature dose this update provides? my update for c 7 was of 1267kb. What does this update benefits? Next Next post: Layman’s take – Symbian PR3.0 teaser-the radical changes?